Though AJ Styles vs. Daniel Bryan was moved to tonight's SmackDown, there will still be a WWE Championship match in Riyadh, Saudi Arabia this Friday. 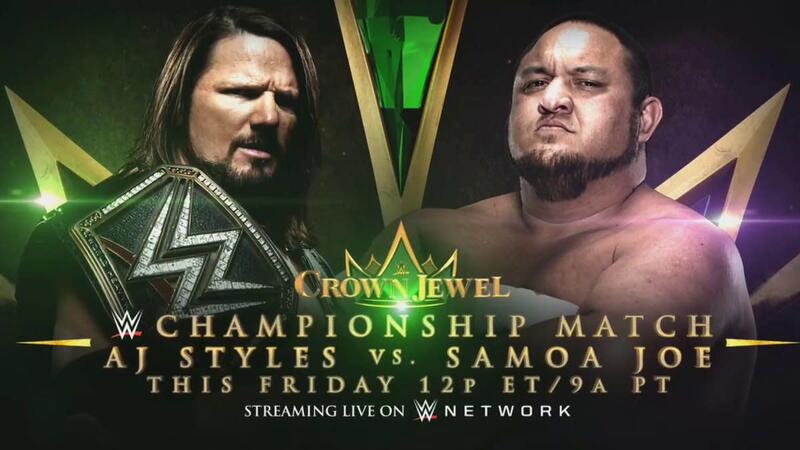 It was announced on SmackDown that Styles will defend his WWE title against Samoa Joe at Crown Jewel. The match was set up in storyline with Styles asking Paige to face Joe at Crown Jewel after Joe attacked Styles and Bryan tonight. After Styles retained against Bryan, they were showing each other respect when Joe attacked them and put them in the Coquina Clutch. Joe then held up the WWE Championship. In what appeared to be the end of their feud, Styles defeated Joe in a no disqualification, no countout match at Super Show-Down earlier this month.